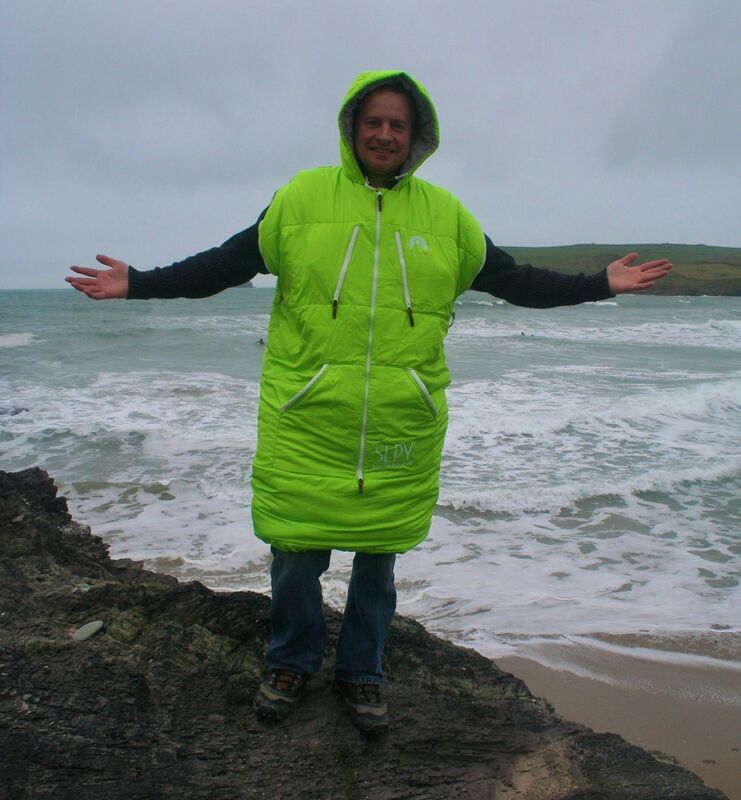 Imagine a piece of kit that you can wear as a jacket and use as a sleeping bag at the same time! Well now you can, introducing the SLPY! When I first saw this product I will admit I was a little confused to where you would use it. It’s marketed for “the modern day adventurers, urban escapists and weekend warriors” which I suppose I fit in to nicely, so I decided to give one a good testing and see what all the fuss is about. Where to start with the design, it has a lot involved! 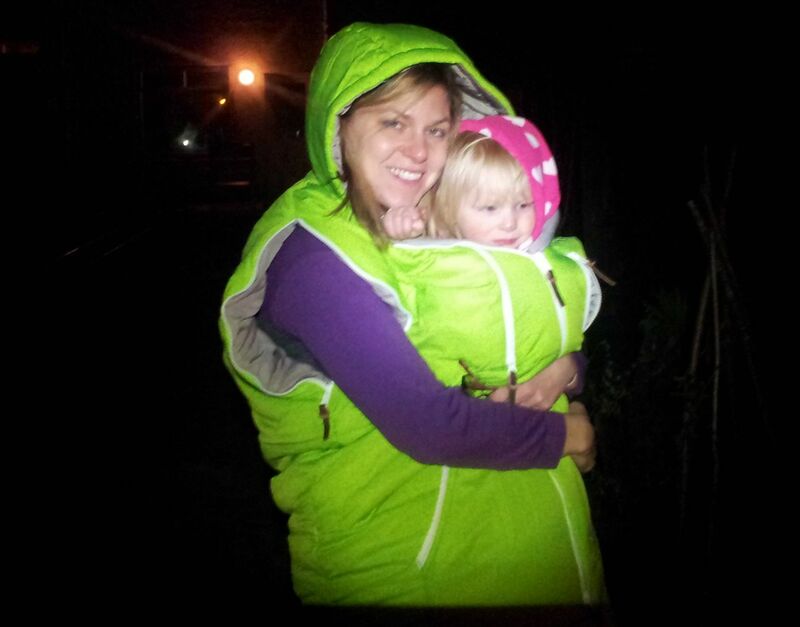 The SLPY is essentially a wearable sleeping bag with a hood. The zip down the front allows you easy access in to the SLPY. I did try and put it over my head and quickly decided coming in from the top was a much better idea! You can undo the bottom zip using the zip cinch system, and undo the arm zips, then hitch it up over your waist, securing it with an internal cord and you are able to walk around as if in a long coat. Or zip them all up and use it as a sleeping bag. If you need the use of your arms just unzip the arms and out they pop. Very multi functional. There is also an internal media eyelet from the left hand chest pocket. Medium – 1297 grams, Large – 1648 grams. So about the same weight as a standard synthetic sleeping bag. The SLPY has a soft feel brushed 300T Polyester lining which feels really comfortable on the skin. This makes it very easy to relax in! The shell is made from soft feel, brushed 300T diamond pressed polyester, which looks great and feels strong when pulled on. I’m very impressed with the shell as it actually looks like it may last well. The SLPY has two chest pockets which are very useful. I found myself keeping my phone and keys in them as I moved about. All of the YKK zips are nice and tough with leather zip-pulls attached to make zipping yourself up a little easier. The zips also have an anti-snag baffle, which works pretty well. Snagging is often a problem with products like this, but I was pretty impressed with the zipping system in general. The hood is an excellent design feature. Just the right size for my head with room to move, and keeps to you nice and warm. 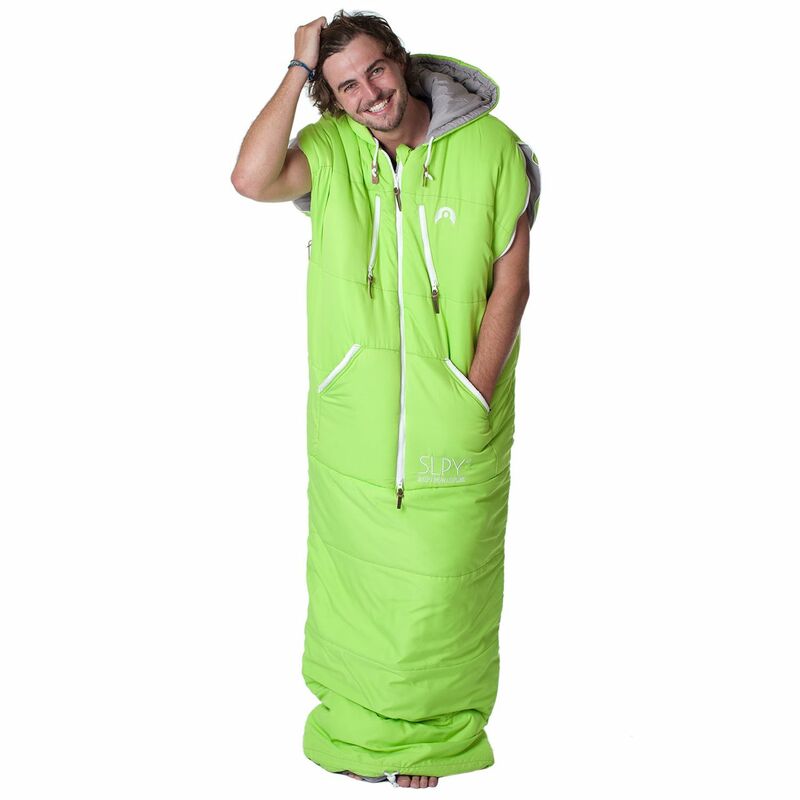 It packs down to about the same size as an average sleeping bag. Around 34cm long, 20cm diameter. The filling in made from 200g per m2 Thermolite Extreme, making the SLPY a 3 season sleeping bag with a temperature rating of: Comfort: 5 degrees, Limit: -5 degrees, Extreme: -15 degrees. Perfect for the summer months camping, great for the winter months inside. The SLPY is easy to clean as it’s machine washable at 30 degrees. I’m yet to test this out. The RRP for the adult Medium SLPY is £119. Although at first you may by thrown by the look and concept of the SLPY, when you actually test one out, all becomes clear. Its very well made, practical and comfortable to wear. For those summer evenings sat around outside, camping on the coastline as the sun goes down, the SLPY will take the chill out of chilling! Perfect for use after a surf, festivals and trips, in fact the scope for use is huge. Great idea, fits a need! My wife also found that it was great to share with the kids!